Facebook’s new Facebook poll feature available to pages and profiles is giving brands a whole new opportunity to nab critical customer intel on the fly. The new feature allows users to ask one question while providing customers with two potential answers. The answers can be accompanied by a GIF image to drive engagement and to encourage your customers to post their opinion. To create a poll, start by writing a status update. Scroll to the bottom and you will find the “Poll” option. Users can then enter their question and two answers into the provided text boxes. 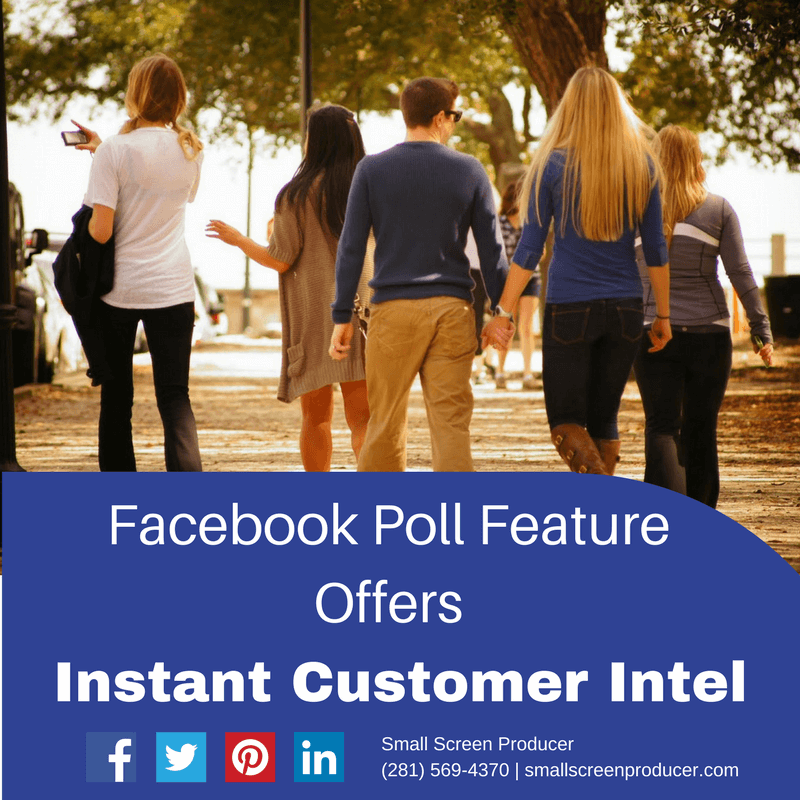 You can opt to have your Facebook poll available for one day, one week or for a customized period of time. Understanding what your customers want from your brand is essential to your business. Running polls on networks like Facebook and Instagram are a great way to gather opinions, make decisions, and to also compare results (i.e. the opinion of your Instagram users on the same poll may differ from those who participated in your Facebook poll). Unlike other forms of gathering customer intel (online or paper surveys, emails, phone calls, etc.) polls are fast and easy for your customers to complete. This substantially increases the chances of your customers responding to your polls and for you to gather the data you need for your business. Stop the guesswork and put Small Screen Producer to work for your business. With years of experience in digital media marketing, we understand what customers of different industries want from your brand and how to cater to those wants to help you achieve your business goals. From Facebook polls and creating a strong social media presence to website design and video production, we have got you covered. Call Small Screen Producer today at (281) 569-4370.